We profile three custom-home projects that redefine retirement living, including a hilltop home in Connecticut designed for a working retired couple and a sprawling ranch in the Texas Hill Country. The Sherwin-Williams Colormix 2012 forecast proves a color palette doesn’t need to stray far from its roots to make a big design impact. Forty hues highlighted in the 2012 selection indicate Earth-inspired color family groups with reds, blues, greens and neutrals dominating the palette. From built-in drain boards to trough sinks to integrated food-prep areas, there are countless options and accessories for sinks today. Kitchen and bath designer Carol Lamkins provides an overview of the latest sink systems and accessories. The ugliest house in America is officially in Springfield, Mo., according to a HomeVestors of America list featured on CNNMoney.com. 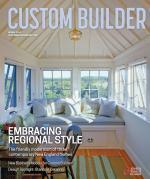 New research by Custom Builder magazine provides insights into client profiles, home specifications, and top business challenges. Among the findings: homes are getting smaller, purse strings are tightening, and move-up buyers rule the market. Check out our full report.